This example was contributed by John C. Sloan. We list models without going thru them in too much detail, so listing does not imply that we endorse them or any papers listed, only that we provide them as inspiration. 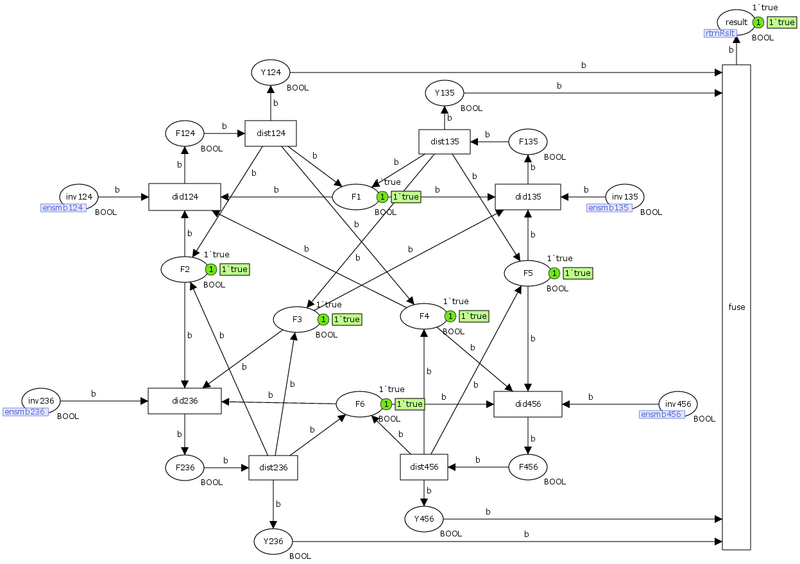 This example models a distributed ensemble of four controllers that enact a fault triage scheme for a particular remote submersible machine. The case study focuses on how one of the controllers coordinates fault classification and evaluation given data streaming from a collection of vibration sensors. J.C. Sloan and T.M. Khoshgoftaar: “Ensemble Coordination for Discrete Event Control”, In: Proceedings of the 13th IEEE International High Assurance Systems Engineering Symposium (HASE 2011). November 2011. The model can be used for state-space analysis and demonstrates how to create a model using very few colors.